Info "Move through Clu Clu Land, but be careful not to hit enemies or fall into a black hole. 1985: Clu Clu Land / NES"
Clu Clu Land is one of 9-Volt and 18-Volt's Microgames in WarioWare: Smooth Moves. It is set in the NES game of the same name, albeit through a 3D viewpoint. 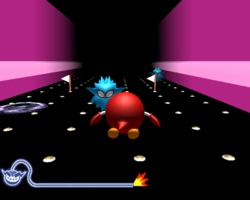 The player must move Bubbles through the level without touching Unira or falling into black holes by pointing the Wii Remote at a direction. Level 1: There are a couple of Uniras. Level 2: There are more Uniras and black holes. Level 3: There are even more Uniras and black holes. This page was last edited on April 4, 2019, at 19:45.